Everyone is different, but we’re going to give you a few case examples on how to take Jack3d. Trust us – even if you’re new to pre workout supplements, it is NOT that intimidating. This is a quality product that does its job – you just need to take the right amount at the right time. So that’s what we’re going to help you with. This information comes from our multiple years of on-and-off usage (with ridiculous results), talking to USPLabs reps, and working in the discussion forums. For men who are brand new to pre-workout supplements, start with one scoop, and mix it with 4-8oz of cold water. Start with around 6oz, preferably in a shaker cup, but you can use any cup and stir it up just fine. For women new to pre workout supplements, start with half a scoop. I think it tastes better right in the middle of the 4-8oz range, but if I’m a bit thirstier than normal, I’ll load it with more water. The problem there is that you might need to use the restroom during your workout – especially if on 2 scoops and you end up with 16oz of fluid. To avoid this, some people like far less water – they take a “shot” of it. You have 45 servings so mix it up and see what you like. Too much water becomes bland, not enough and it becomes too strong. Beginners should start with the dosages above (1 scoop for men, half a scoop for women). However, if you’ve used other nitric oxide supplements, you should roughly know your caffeine tolerance and can guess what you want. If you’re coming from some other product, jump right into 1.5 scoops for men and 1 scoop for women. Over time, you can move up to the maximum of three scoops. Once you’re at that point, it might be time to start considering cycling off for a month (yes – you do need to cycle off of ALL pre workout supplements! We discuss this in our Cycle Jack3d page). Jack3d on an Empty Stomach? This is up to you. Personally, we are fans of the fasted training protocol. I work out on an empty stomach first thing in the morning. This will help you achieve MAXIMUM fat burn, and get it out of the way early. You can then also carb up pretty hard afterward. However, if you do this, you’re going to want to make sure your muscles have some amino acids ready to go in the bloodstream so that you don’t have muscle breakdown – also known as catabolization. This is why you should sip on Modern BCAA just before and during your workout, especially if on an empty stomach. This is also discussed on our Jack3d Stack page. If you’re bulking and don’t want to worry about fat burn, then go ahead and take Jack3d on a semi-full stomach — perhaps 90 minutes after a meal, or 60 minutes after a protein shake. On a full stomach, it will take a bit longer for it to kick in, but it might also last longer as your digestion will be slowed down. Start in the middle of the instructions – Drink your shake about 35 minutes before you work out. Some people have faster metabolisms – especially on an empty stomach – and can take it within 15 minutes of working out. You need to see what’s best for you. If you’re finding yourself getting “into the zone” a bit too late into your workout, back up to 45 minutes pre workout. Don’t forget to properly time up your stretching / warmup. 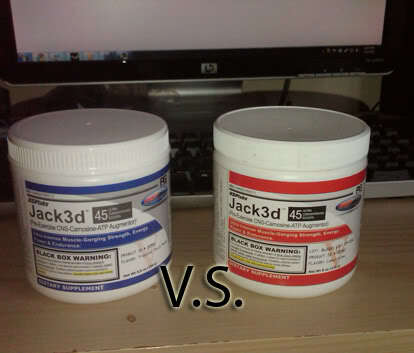 When I’m taking Jack3d, I want it to be on full-steam for my MAIN activity – lifting or high intensity interval training. I don’t want to start feeling the power when I’m just beginning my stretches! So don’t forget to include stretching as “down time” unless you want it to start motivating you during those stretches. If you’re sensitive to stimulants, we don’t recommend taking this after 6pm or so. Some people can sleep right through it, others will be up all night. You need to know your body. Looking to stack Jack3d? Then you must check out our Jack3d Stack page. On that page, we discuss how to mix it with other products to get the most of out of your workouts and muscle gains. There are three paths that you can take – bulking, cutting, or maintaining. When cutting, you have to watch out that you don’t mix your pre-workout supplement (which obviously already has stimulants) with other stimulant-based products, such as the OxyELITE Pro Fat Burner. However, we show great alternatives and timing ideas, so check out that page. Can I Mix Jack3d with Juice? Sure! Mixing it with sugars could help someone who is trying to bulk up a little bit. You really can do whatever you want. Don’t be afraid to experiment. I know someone who took it with almond milk just for fun, although that was a bit weird, but the product still worked! And that, in a nutshell, is how to take Jack3d.